Minigolf courses in Branson are some of the most chosen golf courses by young golfers and young at heart as this place truly gives them an exciting and memorable outdoor adventure. Playing Branson golf is a great way to spend a great time together with the family. Branson golf has become even more popular after the Springfield News-Leader voted it the Best of the Ozarks for two consecutive years. In Branson, you will find many beautiful mini-golf courses that will surely give you a lot of fun. Some of these mini golf courses that you can enjoy around Branson include the Greatest Adventures Mini-Golf, Brookside Miniature Golf, Pirate’s Cove, Shoot for the Stars Mini Golf, and Back to the 50’s Mini Golf. Located at 4800 North Gretna Road in Branson, Missouri, Greatest Adventures Mini-Golf features a fantastic 36-hole course built in 2008. This mini-golf attraction has 2 separate themed 18-hole courses which features the Waterfall Cave, Smokin Dragon, Castle, Knights, Bridges, Fountains, Gorilla, and Egyptian Artifacts. You will find here a large gift shop which offers loads of Branson souvenirs, and adventure toys. Greatest Adventures Mini-Golf is not only a top-rated mini-golf course in Branson, it is also one of the world’s best mini-golf courses. The USPMGA rated Greatest Adventures Mini-Golf as one of the Top 10 Best Championship Mini-Golf Courses in the world in 2011. In fact, Greatest Adventures has 2 championship mini-golf courses which are the 18-hole course on the medieval course and one on the Egyptian/jungle course. You can actually take in both and save money while you’re at it. Twelve years old and over have separate pricing, while ages 5 to 11 and ages 2 to 4 enjoy very budget friendly despite the greatness of the Branson mini-golf itself. While sitting on the outside patio of the building and viewing the spectacular waterfall, you can enjoy some delicious food at Scooter’s Sports Grill which is located inside the building. You can also relax inside where you can watch a show on a flat screen TV. In this mini-golf attraction, you will truly enjoy a unique experience like no other in a place surrounding a recreational sport of mini-golf. There is no other fascinating attraction in Branson, Mo where you and the entire family will be entertained with complete fun and total excitement package in a convenient place located at the heart of Branson. The 36-hole mini golf at the Great Adventures is so perfect to you, your wife, your children and also to your friends. You will find in this place that everybody would love to play in the mini golf course. Playing golf will give you so much joy and excitement. Take your time for family pictures of the picturesque mini golf where you will see animal character statues such as a life sized dragon and chimpanzee as if they are living in the golf course which surely give fun and excitement to your little kid. Once you are tired with the fun activities you enjoy, have a break and get a delicious snack or just relax and watch your children doing their own fun. Located off the main strip and with easy access from most of the lodging and accommodations in the area, players at Brookside Miniature Golf will find the putt putt course provides challenging play, beautiful water features, and great views of the forested areas surrounding the Ozark Mountains. Brookside Miniature Golf features one of the most scenic mini-golf courses in Branson and provides a serene and relaxing way to enjoy the calm surrounding while you’re in town. This Branson golf course have been meticulously maintained and immaculately manicured. As you play in this mini golf course, you will come upon picturesque water features like fountains, waterfalls, rock formations like canyons, bluffs, and ramps – all of which have been carefully placed around the course to give ultimate fun to all golfers. 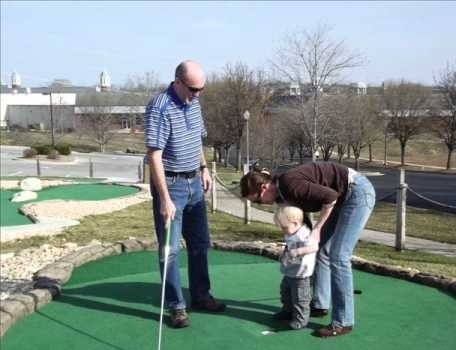 The convenient location of Brookside Miniature Golf provides easy access to great attractions in Branson no matter where you’re staying in town and out of the congested area that you might find at some parts of town. Pirate’s Cove mini golf course is one of the most popular and fun putt putt courses in the Branson area. Beautifully located on the south side of Highway 76 on Green Mountain Drive, Pirate’s Cove provides you a convenient and easy access no matter where you are staying in Branson. 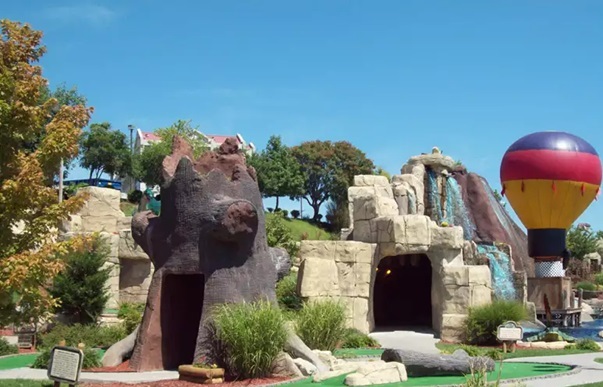 As one of the most popular miniature golf courses in Branson, Pirate’s Cove “The Original Adventure Mini-Golf” provides unique mini golf experience with great fun and exciting adventure in the area. This one-of-a-kind mini golf course shares a pirate theme throughout and became one of the most popular and most-loved miniature golf courses in Branson. This mini golf course features a unique layout, intriguing and challenging holes, and fascinating décor that is sprinkled throughout the lush greenery and spectacular water features that sit amongst the hillside of the Ozark Mountains. Whether you’re putting beneath the beautiful waterfalls or boarding the pirate ship, making your way through the caves, crossing the bridges, or trying to avoid the multiple water hazards that dot the course – you will find that this mini golf course provides fun for everyone. The course not only provides some meticulously-detailed props that set the scene for your private adventure – but also features beautiful natural sceneries that are set throughout the property. Shoot for the Stars Mini-Golf is another fascinating mini golf course in Branson where you’ll get to play a fun mini golf game while taking the 18 steps to becoming a Hollywood star. On this mini golf course in Branson, your hairdresser will charge you $600 for a coif, you are provided a limo to carry your bag on Rodeo Drive, and the paparazzi will wait for your arrival at VIP events. Shoot for the Stars let you experience the landmarks of Hollywood, including Grauman’s Chinese Theatre, the Hollywood Bowl and Capitol Records. In this course, you’ll play golf around and through palm trees, and discover Hot Tips about becoming a star at every hole. An interactive miniature golf course, Shoot for the Stars Mini Golf allows every golfer to play with one of the most fun mini golf courses that you’ve ever played in Branson. Play 18 holes of one of the most fun mini golf courses that you will experience as your journey takes you through some of the most iconic Hollywood landmarks. Palm trees await you at one of the most entertaining and fun courses to play in Branson. Young and Old, big and small are sure to enjoy this fun and challenging course that leaves everyone smiling. If you’re looking for an affordable and easily accessible miniature golf course to play in Branson, then don’t miss the chance to visit Back to the 50’s Mini Golf. As one of the newest miniature golf courses in Branson, this 1950s themed miniature golf course provides plenty of fun and obstacles for your next round. It’s easy to access the golf course as it sits right alongside the famed Highway 76 Strip. This mini golf course is within walking distance to some attractions in the area such as hotels, shops, and restaurants. Mini Golf Courses that you will find in Branson provide every family a great way to experience a truly exciting golf game and memorable outdoor adventure while enjoying a wonderful time together.